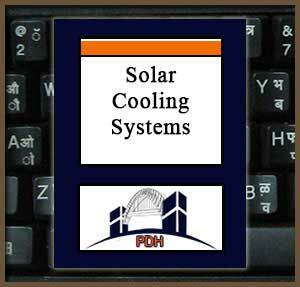 Learn when solar cooling may be practicable and cost-effective, and when it is unlikely to be so. Learn about the two refrigerant combinations that have been used most successfully in solar-powered absorption cooling systems. Learn the advantages the Rankine cycle heat engine has over the Stirling and Brayton cycle heat engines for solar cooling. Learn how the type of collector used affects and limits the design of solar-powered absorption systems. Learn how the means of delivery of the heated fluid to the absorption cooler affects and limits the design of solar-powered absorption systems. Learn why an absorption cooler that relies on on-off cycling for temperature control has a drastically reduced average coefficient of performance. Learn why a cooling tower is usually required as an element in a solar-powered absorption cooling system. Learn the fundamental difference between the closed-cycle absorption and Rankine systems, and an open-cycle desiccant system. Learn about the differences between a ventilation-mode desiccant system and a recirculation-mode desiccant system. Learn about other cooling methods that utilize solar heating equipment, but do not utilize the solar energy directly for cooling.